You want to make sure you fix it as well as prevent it from happening again. A popular approach is to use the Five Whys root cause analysis technique. People who are new to Five Whys often run into a couple problems right away. The item that is your initial problem is very likely the cause of someone else’s problem. It can be helpful to traverse in both directions when doing analysis, but in general, if you assume you’ve identified a valid problem, focusing on “Why did this happen?” will be the most beneficial. The second thing that people get hung up on is the number of whys. This one’s pretty simple. It’s just a guideline, so keep askin’ till you can’t ask no more. It may be 3, it may be 10, but chances are that if you haven’t gone at least 5 whys deep, you haven’t found the root cause. Keep thinking! 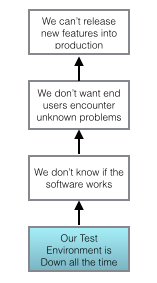 In the traditional software development model, developers build a feature and hand it off to QA to be tested. The QA team tests the feature and discovers a defect. The defect is logged, prioritized, and at some future date, addressed by the development team. Delays are inherent to this system due to departmental and hand-off/communication issues. Developers have moved on to new features and don’t want to be interrupted. Likewise, QA doesn’t want to interrupt the developers. At some point after all known “SEV 1” defects are fixed, a decision is made to go into production. The remaining known “low priority” defects may or may not ever get addressed. In the agile software development model, developers and QA staff work closely together to define acceptance criteria before development begins. They communicate at least daily and whenever questions or issues arise. 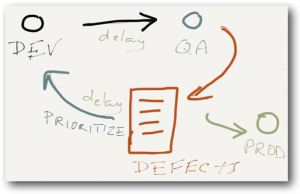 If QA discovers a problem, it is immediately fixed by the developers before the story is accepted. There is no need to log or prioritize the defect. At some point, a decision is made to go into production. There are no known defects. In either model, defects will inevitably be discovered in production. In the agile model, new stories will be created for them, which will be immediately prioritized and fixed rather than being placed on a defect list. Jeremy Anderson and I just spent several hours trying to integrate Backbone with a set of XML RESTful services. Backbone comes with built in support for JSON services, but none for XML. We started by trying to follow this article about using Jath . It seemed promising, but had some holes. Most notable, we were hesitant to make modifications to the core backbone.js. Doing this would have prevented us from easily upgrading to new versions, etc. The current release version of Backbone (0.5.3) does not allow for easily adding the options we needed to the ajax request inside sync(). While perusing the Backbone source, we discovered the the current master version on GitHub had some enhancements that made our lives easier. Downloading the master version, we were now able to pass the new parameters in the options hash. # delegate to it at the end of our new sync. # that override the default JSON configurations. Be sure not to override the incoming options with a new hash. You must simply append (extend) to the incoming options. The last step is to get the incoming XML converted to JSON so the rest of Backbone can understand it. Below is an example using Jath as described in the above link. Is redundant and smells rather funky. But it’s dope to a waterfall junkie. Yesterday, as part of the 2010 Michigan Pairing Tour, I had the opportunity to spend a day at the new offices of BillHighway in Troy, MI. They have a very nice setup including an area with leather couches, a large screen TV and XBox + Wii consoles. BillHighway “bills” themselves as a “Quickbooks for Communities”. One of my longtime friends works there, and I’ve had the privilege of getting to know their CIO over their past few years of impressive growth. BillHighway is primarily a VB.NET shop. I’ve never spent more than 5 minutes looking at .NET code, and the last time I used VB was about 12 years ago. It promised to be an eye-opening experience. In the morning I paired with André LaMonde, a VB.NET hacker. We were working on standardizing some of the UI components to be in line with a new Look & Feel for their site. I was briefly thrown for a loop by the unfamiliarity of Visual Studio and strange syntax, but quickly recovered and was able to follow what was going on without too much trouble. 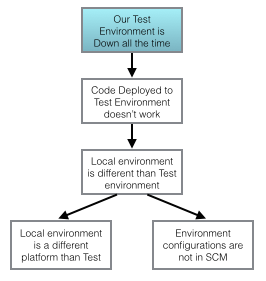 Unit testing is not regularly practiced by the team, so we had some good discussions about some of the challenges that dealing with legacy code bases brings about, and some strategies for integrating tests going forward. We struggled with NUnit for about 15 minutes, then bailed out and were able to get some tests up and running with the framework built into VS 2008. Overall, I had a great time, and picked up some 3l1t3 .NET skillz. I’m looking forward to the next stop! Last Friday was the first stop on the 2010 Michigan Pairing Tour. I sat down with Ilya Sterin at a Caribou Coffee in Grosse Pointe, Michigan and we started off by discussing a few of the projects he was currently working on. We decided to write some tests around code that he had written to post Facebook status updates. This led use Mocks for the Facebook API, and refactor some of the code to be more testable. During this refactoring, Ilya brought up the question of whether we should favor writing testable code at the possible expense of simplicity. I think that writing testable code generally results in simpler code (not gold plating, etc, etc), but I replied that it’s only important to write testable code if you care if it works. After lunch at a nearby Sushi bar we tackled a different project that had a lot of concurrency going on. Ilya has a lot of experience with java threading and he has an excellent handle on how it all hangs together. I learned quite a bit from him in this segment, include exposure to the Guice DI framework. We were able to bring a couple consumer/producer classes under test. This again required some refactoring–mostly along SRP lines–and resulted in a simpler and cleaner design. Overall, it was a great experience, and exactly what I hoped to get out of the pairing tour. I’m looking forward to my February date which is tentatively scheduled for next 2/12/2010. I’ll post more details when it’s confirmed.